Benefect®'s Multi-Purpose Cleaner (MPC) is a revolutionary Cleaner Concentrate that achieves the professional results you need without using hazardous synthetic chemicals. Benefect Multi-Purpose Cleaner (MPC) is Green Certified, 100% Botanical, highly effective and an extremely versatile concentrate that cleans everything from mirrors, to toilets, walls, countertops and floors. When diluted for general use it replaces 4 - 5 popular chemical cleaners. 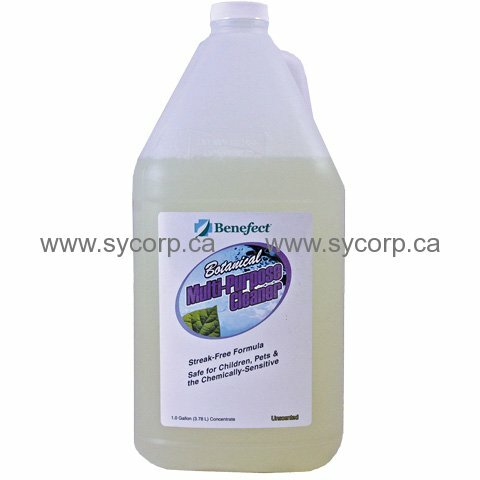 Prior to using Benefect Disinfectant for mold remediation, we recommend cleaning with Benefect Multi-Purpose cleaner. It is best used as a wipe application to remove surface molds. ENVIRONMENTALLY RESPONSIBLE Made from 100% renewable resources, it biodegrades aerobically & anaerobically. It has no EDTA, NTA, petrochemicals, preservatives, optical brighteners or phosphates. The V.O.C. * level is only 0.05% which decreases health risks to building occupants (some cleaners have up to 10%). *V.O.C. - the portion of a cleaner that evaporates and pollutes indoor air pollution, contributing to Sick Building Syndrome. Personal Protective Equipment (PPE) is not required, making Benefect Multi-Purpose Cleaner the safest choice for home and business owners and your employees. Benefect Multi-Purpose Cleaner is also suitable for nursing homes, hospitals, schools, universities, health clubs, boarding or breeding kennels, sports equipment, food preparation facilities, or any other residential commercial or medical application where high risk or chemically-sensitive individuals may be present. • No Fragrances, Dyes, Petrochemicals, Phosphates, EDTA, NTA or other hazardous or unecessary ingredients.